Where I live there are few jazz gigs available. It's probably the same where you live. Venues that have jazz on the agenda are more the exception than the rule. This means that amateur jazz musicians usually play for free, for lack of opportunities. I know I have been doing that too often since I started out on my jazz journey. Sometimes, I do not even get expenses paid, which simply means that I have to PAY to play somewhere. For, my car runs on petrol, my guitars need strings and I did not get my instruments and my amp for free. As a matter of fact, I take about 4k worth of gear to any free gig. And then there's the time investment. A local gig takes up about 5-6 hours of my time. And what about all the years I put in on the instrument? The talent and time it requires to even be able to play jazz on a certain level is considerable. It takes years. Funny, how people expect me to play the stars from heaven (Dutch saying) and then offer me two free consumptions as a fee ... They even think that is perfectly normal and acceptable. 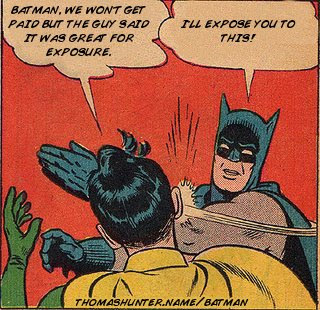 O yeah, don't believe in the "exposure" myth. It is so stale I'm not even going to explain why it is rubbish in most cases. So why do people play for free? Probably because they rather rather play for free than not gig at all ... At least, that's how I used to feel. But this has changed. As I'm getting older, I'm not so keen anymore to be on that stage. More and more I find free gigs downright insulting. Every free gig reminds me that my art and skill level is worthless and it invariably leads to me driving home with a bad feeling. Was it worth it? What is THAT great? Nah, usually not. 1. It devaluates the profession. When you play gigs for free, you are sending the message that the title “musician” is not worthy of being an occupation. We don’t need more people believing that being a professional musician is nothing more than a silly dream or something you can “always do for fun on the side”. 2. You are cheating yourself. Think about everything that you have done to get to where you are now. When you play a gig, you are displaying thousands and thousands of hours of hard work to an audience. You’ve suffered through lots of frustration, sacrifice, and even money to hone your craft. Don’t let all of this time and energy go to waste by giving it all away for free! 3. It hurst the music economy. So maybe you’ve read all of this so far but you’re thinking: “I’m not really a professional musician. I don’t care about getting paid; I just love to play. So what if I play a gig for free? I have a day job!” Well hear me out on this one. If there is any reason why you shouldn’t play gigs for free, it’s because you are hurting the music economy by doing so. A huge problem professional musicians are having right now is that venues are not willing to pay for music, or are only willing to give insultingly low amounts. This I can relate to. Venues know darned well that they can get most amateur outfits for free. And sometimes the quality of the music on offer may even deserve little to no pay. So it's probably not all black and white. But for advanced players and experienced musicians - even those that have a day job - it should be at least doubtful. 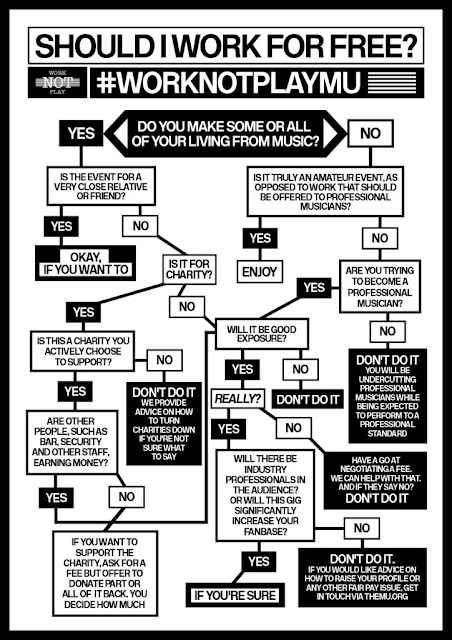 I came across this diagram that can help you decide if you should do that free gig or not. It was created by the folks of Work Not Play – a UK-based musician’s union. It is very helpful to make a decision. I have made up my mind about free gigs in the meantime. I'm not doing them anymore. For local gigs that require little travelling, the least people will have to offer me is to cover my expenses. Outside my region, I will expect a reasonable fee. Or I will stay at home happily ... I have other channels that enable people to listen to what I am doing on that guitar.